Hold the trusted power of Smith & Wesson in the palm of your hand with the CK112S Bullseye Linerlock Black Serrated Folding Knife. With one glance of the Bullseye Folder, Smith & Wesson's attention to detail is immediately apparent in the intricately designed aluminum handle. Bullet engravings remind the user of this pocket knife's supremacy. Ambidextrous thumb holds provide effortless one-handed opening to reveal a high-carbon 7Cr17 stainless steel blade with an extreme edge and cutting capabilities. 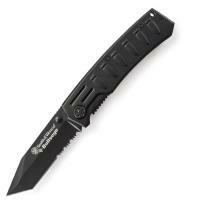 The combo-edge design offers a partially serrated blade with a Tanto-style tip for optimal cutting power. Work confidently knowing that a linerlock mechanism secures the open blade into a fixed and stable position.